Why didn’t I read So Totally Emily Ebers sooner? It would have been perfect to talk about in the elementary schools for summer reading because (a) I liked it, (b) it takes places over the summer, and (c) I could have mentioned the Lisa’s Yee’s other books to bulk up the booktalk. It’s probably too young for rising ninth graders... right? Opinions anyone? 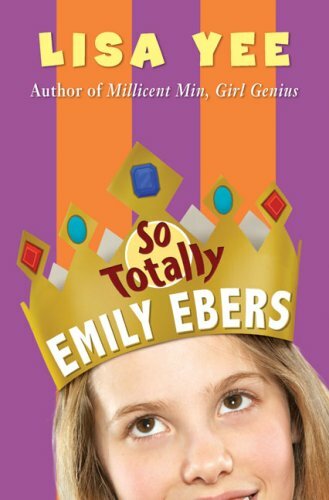 So Totally Emily Ebers is the third book in the same universe, actually the same time period, of Millicent Min, Girl Genius and Stanford Wong Flunks Big-Time. The three books cover the same ground, but with a total change of the character perspective. You have to admit, that’s kind of interesting. Now I recall why I didn’t read this book. It was because I wanted to go back and at least skim the other books first. Let me get back to the story. Emily Ebers and her mom have just moved across the country after leaving her father on the East Coast. Her parents are recently divorced, and Emily takes out her anger on her mother while writing her journal entries to her father. Emily meets Millicent as they play volleyball over the summer, a sport that neither of them wanted to play. They grow closer as friends, even though Millicent has some things about herself that she’s hiding. Emily also develops a crush on Stanford, and with her credit card spending, catches the eyes of the popular crowd. The reader can see the truth coming, but Emily can’t, and that’s a big part of the charm of this title. I loved my sense of Lisa Yee’s humor throughout. I also really felt for the so trusting, so enthusiastic, so open Emily. Overall, a very fun read which will make me go back and re-read the others. I read Millicent Min a couple years ago and enjoyed it, but I never got around to the others. Maybe I'll have to sometime. Yes, they're too young for rising ninth-graders. Definitely. But for older elementary school, I think it's right on the dot. Poetry Friday: Me I Am!